What’s Santa’s phone number at the North Pole? It’s now easy to find. Did you know that the little ones can call Santa? Yes they can. 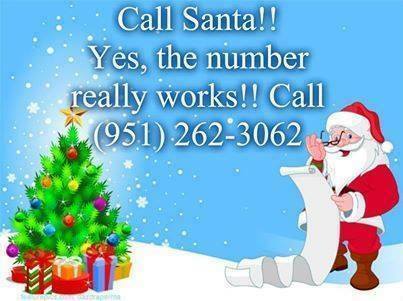 The kids can call 951-262-3062 to leave Santa a message about what they would like for Christmas. He will ask them for their wish list and tells them to be good to their parents. By The way, I would just call from your cell phone, it does charge long distance on a landline, since most cell phones have unlimited long distance it’s free.